Cloudflare Origin CA provides a secure SSL connection between your server (“origin”) and Cloudflare. 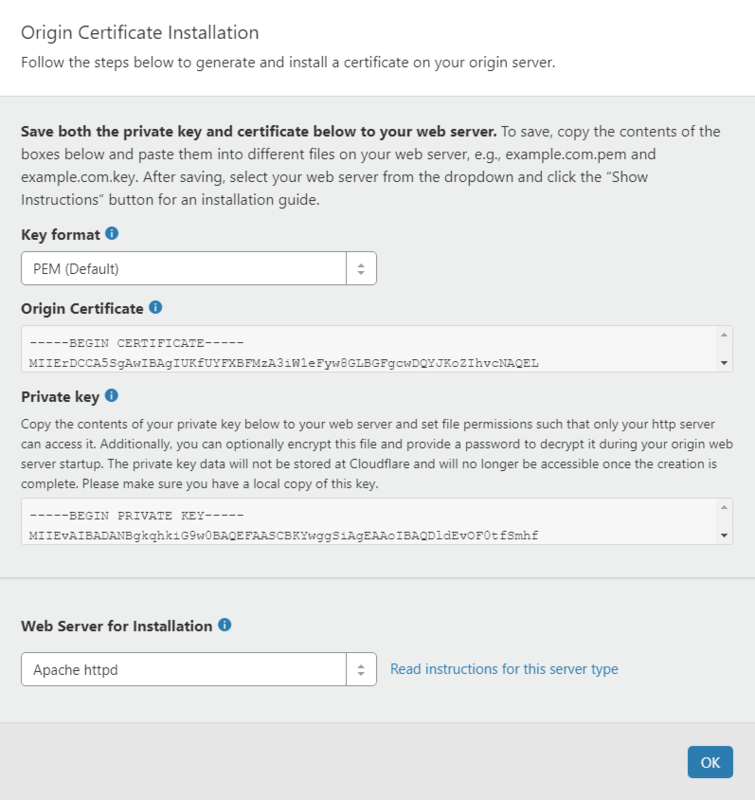 In this article we will configure an Origin cert for Apache on Ubuntu 18.04, though it should also be useful for other Linux distros. You should already have your Apache server configured and serving web pages for your domain. We have several guides to help you set up an Apache web server from scratch on Ubuntu 18.04. Log in to Cloudflare and navigate to the Crypto page. Scroll down to Origin Certificates and click Create Certificate. In Origin Certificate Installation, the defaults should be Private Key Type: RSA with 15 years validity. Click Next. In the next screen, the Key format should be PEM (default) and Web Server for Installation: Apache httpd. Copy your Origin Certificate and Private Key to a text editor for later. We will need to paste these into Linux. Finally, click OK to close. Create a new directory where our Cert and Key will reside. Using nano text editor, create a new file example.com.pem (where example.com is your own domain). Create a new file example.com.key (where example.com is your own domain). There should already be a block for <VirtualHost *:80>. You need to add a new block underneath it for SSL port 443. You can also add a rewrite condition in your port 80 block to redirect all requests to https. Test the configuration syntax for errors. If you see Syntax OK, restart Apache. Note, it can take 5 or 10 minutes for Cloudflare to deploy certs. Make sure that SSL in Cloudflare is set to Full (Strict). Great walkthrough. On the final step I was running into a “Invalid command ‘SSLEngine'” error, needed to run “sudo a2enmod ssl” to fix this.